BRIDGEWATER, N.J. -- President Trump appeared to change his story Sunday about a 2016 meeting at Trump Tower that is pivotal to the special counsel's investigation. 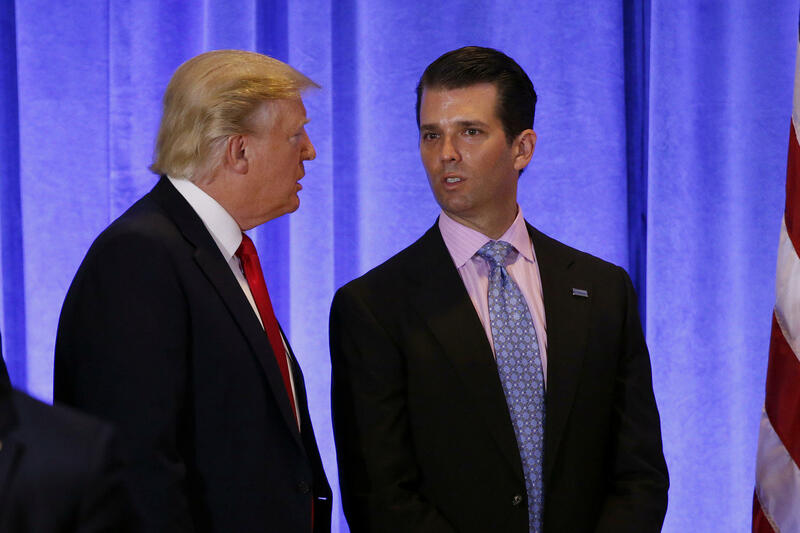 Mr. Trump tweeted that his son met with a Kremlin-connected lawyer to collect information about his political opponent. Sunday's development comes on the heels of a campaign-style rally Saturday night in Ohio where he took aim at the media and Democrats. "Fake News reporting, a complete fabrication, that I am concerned about the meeting my wonderful son, Donald, had in Trump Tower," Mr. Trump wrote. "This was a meeting to get information on an opponent, totally legal and done all the time in politics -- and it went nowhere. I did not know about it!" That is a far different explanation than Mr. Trump gave 13 months ago, when a statement dictated by the president but released under the name of Donald Trump Jr., read: "We primarily discussed a program about the adoption of Russian children that was active and popular with American families years ago." The misdirection came amid a series of searing tweets sent from his New Jersey golf club, in which he tore into two of his favorite targets, the news media and Robert Mueller's ongoing investigation into possible links between the president's campaign and Russia. Mr. Trump unleashed particular fury at reports that he was anxious about the Trump Tower meeting attended by Donald Trump Jr. and other senior campaign officials. Mr. Trump's critics immediately pounced on the new story, the latest of several versions of events about a meeting for which emails were discovered between the president's eldest son and an intermediary from the Russian government offering damaging information about Mr. Trump's opponent, Hillary Clinton. Betraying no surprise or misgivings about the offer from a hostile foreign power, Trump Jr. replied: "If it's what you say I love it especially later in the summer." Sunday's tweet was Mr. Trump's clearest statement yet on the purpose of the meeting, which has become a focal point of Mueller's investigation even as the president and his lawyers try to downplay its significance and pummel the Mueller probe with attacks. On Sunday, Mr. Trump again suggested without evidence that Mueller was biased against him, declaring, "This is the most one sided Witch Hunt in the history of our country." CBS News' Weijia Jiang reports that Mr. Trump has tweeted at least 24 times that the investigation is rigged, a hoax and a witch hunt -- without making the distinction between collusion and meddling. As Mr. Trump and his allies have tried to discredit the probe, a new talking point has emerged: that even if that meeting was held to collect damaging information, none was provided and "collusion" -- Mr. Trump's go-to description of what Mueller is investigating -- never occurred. "The question is what law, statute or rule or regulation has been violated, and nobody has pointed to one," said Jay Sekulow, one of Mr. Trump's attorneys, on ABC's "This Week." White House counselor Kellyanne Conway said on CBS' "Face the Nation" that the president is referring to collusion when he criticizes Mueller's probe. "But in terms of the meddling, there's no question," she said Sunday. But legal experts have pointed out several possible criminal charges, including conspiracy against the United States and aiding and abetting a conspiracy. And despite Mr. Trump's public Twitter denial, the president has expressed worry that his son may face legal exposure even as he believes he did nothing wrong, according to three people close to the White House familiar with the president's thinking but not authorized to speak publicly about private conversations. Mr. Trump's days of private anger spilled out into public with the Twitter outburst, which comes at a perilous time for the president. A decision about whether he sits for an interview with Mueller may also occur in the coming weeks, according to another one of his attorneys, Rudy Giuliani. Mr. Trump has seethed against what he feels are trumped-up charges against his former campaign chairman, Paul Manafort, whose trial began last week and provided a visible reminder of Mueller's work. And he raged against the media's obsession with his links to Russia and the status of Michael Cohen, his former fixer, who is under federal investigation in New York. Cohen has indicated that he would tell prosecutors that Mr. Trump knew about the Trump Tower meeting ahead of time. Despite a show of force from his national security team this week as a warning against future Russian election meddling, Mr. Trump again deemed the matter a "hoax" this week. And at a trio of rallies, he escalated his already vitriolic rhetoric toward the media, savaging the press for unflattering coverage and, he feels, bias. "The Fake News hates me saying that they are the Enemy of the People only because they know it's TRUE," Mr. Trump tweeted Sunday. "I am providing a great service by explaining this to the American People. They purposely cause great division & distrust. They can also cause War! They are very dangerous & sick!" The fusillade of tweets came from Bedminster, Mr. Trump's golf course, where he is ensconced in a property that bears his name at every turn and is less checked in by staffers. It was at the New Jersey golf club where a brooding Mr. Trump has unleashed other inflammatory attacks and where, in spring 2017, he made the final decision to fire FBI Director James Comey, the move that triggered the Russia probe. Mr. Trump was joined for his Saturday rally in Ohio by former White House communications director Hope Hicks, who departed the administration earlier this year. Her unannounced presence raised some eyebrows as Hicks has been interviewed by Mueller and was part of the team of staffers that helped draft the original statement on the Trump Tower meeting.